What is the (Kanban) Board view? The Board or Kanban view allows you to visualize and manage your workflow as tasks go through different stages. Paymo provides three default stages: To Do, In progress and Done - but is not limited to them. You can also define custom stages that adapt to your own process by clicking on the +Add Column button to add a new stage in a workflow. Alternatively, you can rename columns and even add numbers at their names to signal the work in progress limits. By default, all tasks are converted into cards that are located in the backlog. You can also add new ones through the +Add Task button on top of the backlog. From here on you move cards to certain columns based on the stage of the task. To do so, simply drag and drop a card from one column to the other. Five cards will be displayed when grouped and ten when ungrouped, with the possibility to load more by clicking on Show More Items. To view/edit a card, click on it and a Full Task Detail window will pop out. 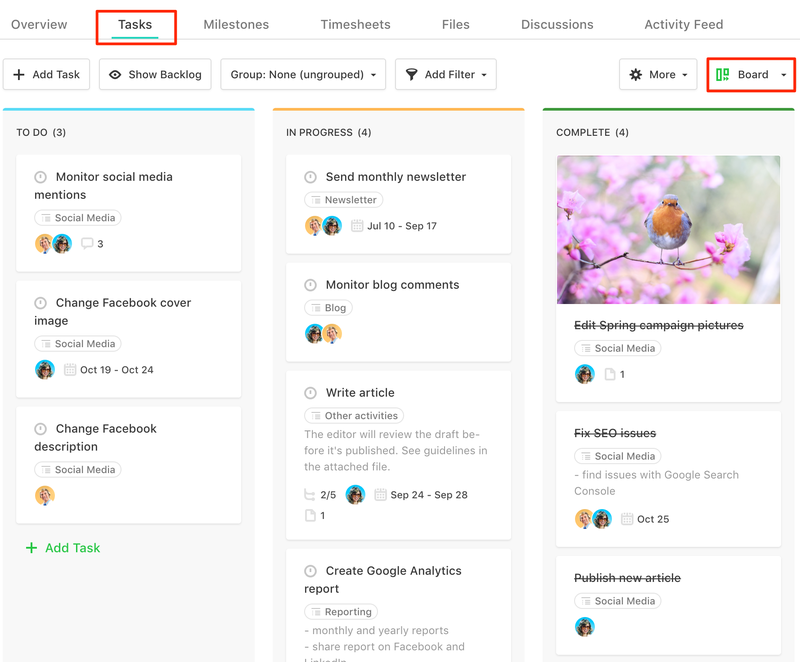 This will allow you to view/edit all the information associated with the task like due date, assigned user, add comments, add files, set due date and time budget alerts, etc. You can also filter cards by their name, date range or assigned users and group them by users and billing type.